Observably, national and international concerns on the return to normalcy in Cameroon is growing by the day. Obviously so as the crisis remain unabated, especially in the North West and South West Regions wherein hitherto industrial action gave way to disturbing killings, ransom-taking and destruction of public and private property. That the European Union on March 5, 2019 added her voice to that of other bilateral and multilateral partners of Cameroon to express her worry over the escalation and the nefarious effects the crisis is having elucidates more the wish of all and sundry to see priceless peace once again reign in this once haven of peace called Cameroon. As a viable partner of Cameroon, with whom the country is deeply involved in mutuallybeneficial partnership, the European Union could not logically be mute on the crisis that has shaken the foundations of the country's togetherness. Inasmuch as government salutes the interest shown the country in trying moments by both the European Union and other preceding organisations and countries, she feels facts must remain sacred if lasting solutions must be jointly sought to the nagging security challenges. Simply put, truth and objectivity absolutely need to prevail. The ab sence of which breeds mistrust which can at best worsen the already disturbing situation. Like others, the European Union thinks dialogue is one of the surest means to journey the country and its population out of the dilemma. Visibly, the country has been into the much talked about dialogue ever since the crisis began. When people disagree, it means they see sometimes the same things, from different viewpoints. Solutions come when they keep their respective egos and sue for common good. Possible only when there is reciprocal good faith! Going by the reaction of Communication Minister, René Emmanuel Sadi, following the publication of the European Union position on the crisis, the comments were not a true reflection of the reality on the ground. Government and the European Union have thus made their positions amply clear on the raging crisis. That too is dialogue. The "inclusive political dialogue" preached by the European Union today is as old as the crisis. President Paul Biya from the debut has moved from talk to action. The Head of State first ordered the setting up of two inter-ministerial ad hoc committees: One to look into Teachers' concerns and the other into that of Common Law Lawyers. All were to at term propose lasting solutions to harness the sectors for the good of all. The technical and administrative solutions proposed thus far are fruits of the dialogue among stakeholders. Even the arrest of the leader and supporters of the Cameroon Renaissance Movement, which the European Union sees as prolonged, likewise their trial which the organisation qualifies as bias, doesn't go down well with the government. Time and again, the government has said it loud and clear that the arrest and detention of the MRC leader and his supporters are purely in line with the laws of the land which forbid certain acts that were regrettably perpetrated by the concerned. Their trail at the Military Tribunal is thus based on the nature of the alleged crime: "Insurrection, hostilities against the fatherland, rebellion and destruction of public goods." The European Union is not certainly oblivious of the damage and prejudice actions perpetrated by the party and its supporters left on the country (within and without, notably her diplomatic representations). Some schools of thought even qualified the acts as pure sacrilege. 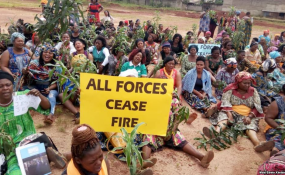 Cameroon absolutely needs peace but the much-needed peace; if it must be genuine, has to emanate from unselective rectitude across the national triangle. Conviviality is therefore imperative in seeking lasting solutions to the worrying crisis in Cameroon.